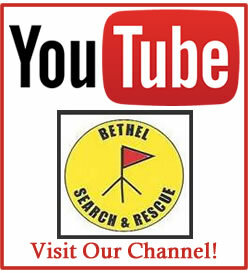 The Bethel Search and Rescue team is located in Bethel, Alaska. Its headquarters are located at 499 Chief Eddie Hoffman highway, across the street from the Yupiit Piciryarait Cultural Center, behind the old Korean Church. Bethel is 400 west of Anchorage, and 60 miles from the mouth of the Kuskokwim as the raven flies. The region in which Bethel is located is called the Yukon-Kuskokwim Delta, and consists of 50 communities and about 25,000 people. 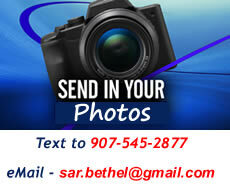 Bethel is the hub community and centrally located, making it an ideal location for a SAR group such as BSAR. Bethel is located along the Kuskokwim, which connects many communities along its banks. The Kuskokwim River is the 2nd longest river in Alaska, after the Yukon River. The Kilbuck Mountains loom up to the east of Bethel. Three-Step Mountain is the closest, about 29 miles from Bethel. Bethel is surrounded by the villages of Oscarville, Napaskiak, Napakiak, Kwethluk, Akiachuk, Akiak, Atmautluak, Nunapitchuk and Kasigluk. Other nearby villages include Eek, Tuntutuliak and Tuluksak. Villages on the Yukon River closest to Bethel include Russian Mission, Marshall and Pilot Station. There is a lot of traffic between Bethel and these villages and as a result, some travelers end up missing for one reason or another. Many hunters also venture into the wilderness for game, and sometimes fail to come back. Some get lost or something happens to their equipment, such as motor breakdowns or simply run out of gas. 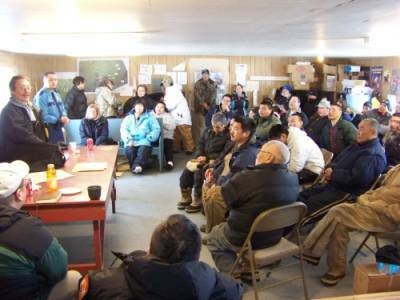 The Alaska State Trooper report that almost 200 people were lost or missing in 2009 in the Y-K Delta while traveling between villages or going out hunting. Most of the lost are usually found right away during initial searches by aircraft, afterwhich SAR teams nearest to the stranded travelers are dispatched to retrieve the missing persons. However, some remain missing for a time. That’s when BSAR and other village SAR groups spring into action, usually within the hour when a person is reported missing. 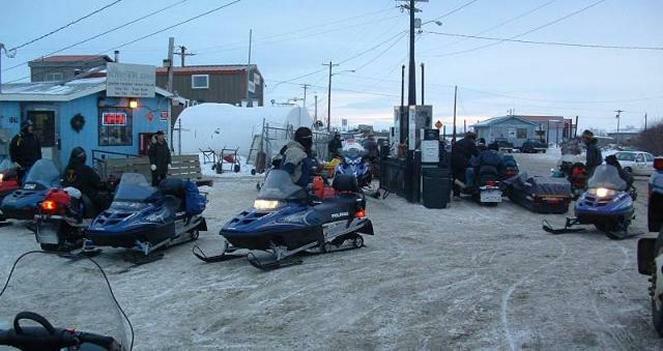 A Bethel SAR team of ten snowmachines gas up at North Star Gas in Bethel in preparation of searching for a missing traveler between Atmautluak and Napakiak. BSAR President Peter Atchak and Alaska State Trooper Henry Ching talk with SAR volunteers in Kongiganak during a debriefing session at the conclusion of a search for a missing young man from Kongiganak, who had gotten lost while returning from a basketball game in Tuntutuliak. Sadly, the young man did not make it. 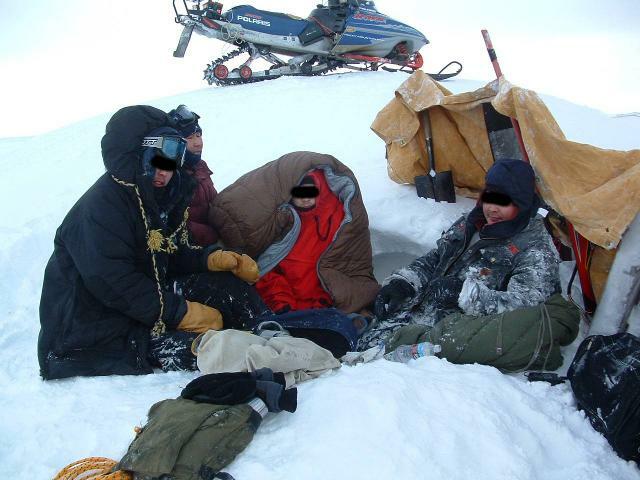 During these moments, it is best to pull SAR teams together and provide as much comfort and encouragement as possible. 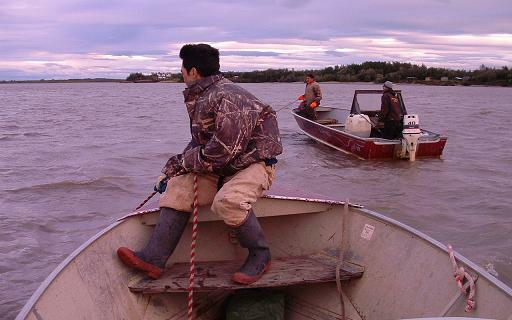 Bethel SAR volunteers drag the bottom of the Kuskokwim River in front of Bethel after a boat hit a barge the night before in which a man was thrown overboard and believed drowned. Several others in the boat were injured and needed medical attention. The man was found a couple of days later about one mile downriver from this site.